"A quick and easy side dish that's sure to impress, this is a refreshing change to plain couscous." Prepare the couscous according to package directions using the drained mandarin orange liquid as part of the specified amount of water. 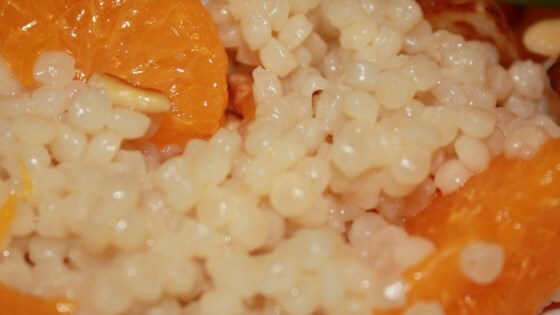 Fluff the couscous, and gently stir in the pine nuts and mandarin oranges. Serve hot. I chilled this rather than serving it warm. We liked it, although I felt it was a bit bland. This is a pretty good dish, although a little dry. But then again, that's couscous. I really loved this! I issued the pine nut couscous and added some roasted garlic and herb seasoning and it tasted great! My BF liked it but I found it bland even though I added a tsp of dried basil to jazz it up. I'll probably make it again but not often.